Corruption by Russian President Vladimir Putin and his administration in Moscow has produced tens of billions of dollars worth of illicit funds for the Russian leader and his top aides, according to U.S. officials. Putin is estimated to have amassed a fortune worth at least an estimated $28 billion through kickbacks from projects like construction at the Sochi Winter Olympic games, holdings in Russian real estate and energy conglomerates, and kickbacks from deals with associates going back to the late 1990s. Corruption by Putin and his inner circle is said to be pervasive and a normal part of business under his authoritarian regime. For the first time in at least a decade, Putin is beginning to come under fire from the West after the military annexation of Ukraine’s Crimean peninsula. In the past, the Obama administration had imposed a strict political ban on critical reporting within policy, intelligence, and law enforcement circles as part of the failed "reset" policy designed to win closer ties to Russia. Following the Crimea annexation and facing new threats of military action against Ukraine, the administration last month launched a limited campaign of financial sanctions aimed at the Putin regime. The Treasury Department on March 20 imposed financial sanctions on 16 Russian officials associated with Putin’s corrupt financial network, as well as Bank Rossiya, the financial institution used by Putin and his cronies to both launder funds and conduct deals. The Putin corruption network is centered in a network of associates, many of whom are former KGB political police and intelligence officials like Putin. The corruption network vastly expanded once Putin became president in 2012. "Corruption has ceased being a problem in Russia; it has become a system," says a 2011 report by Russian opposition figures. "Its metastases have paralyzed the country’s social and economic life. The annual turnover of corruption in Russia now stands at $300 billion." Former Deputy Prime Minister Boris Nemtsov, one of the report author’s told Radio Free Europe/Radio Liberty that key figures linking Putin to billions of dollars worth of corruption are largely unknown to most Russians. What the Russian public does not know is that these friends of Putin "got rich not because they created Facebook or Google, or something else, but did so absolutely at the expense of the state and state property," Nemtsov said. Putin controls an estimated 37 percent of shares in the oil and gas company Surgutneftegaz; a 4.5 percent stake in the huge gas company Gazprom; and 50 percent of the oil trading company Gunvor. Putin has obtained cash from Gunvor through an associate, Gennady Timchenko, one of those sanctioned by Treasury and described as "directly linked to Putin." Putin and his associates stole between $25 billion and $30 billion from funds used in developing Sochi for the Olympics. Putin has spent the illicit funds since the early 2000s on luxury items, including 20 residences, 58 aircraft, and four yachts. Putin controls the largest energy company in the world, Gazprom, which was set up in 1989 when all assets of the Soviet Union’s Ministry of Gas Industry were converted to a "private" concern. Through Gazprom, Putin has siphoned off cash from the company’s capital expenditures that in 2011 were estimated to be worth $52 billion. Corruption through Gazprom is known by the euphemism, according to the Russian opposition study, as "value detraction" and was estimated to be 70 percent of the capital expenditure. Putin also cashed in through his links to the Russian-German firm Saint Petersburg Real Estate Holding Co., serving as a director and on its advisory board prior to becoming president. The company, known by its Russian acronym SPAG, has been linked to Russian and Colombian organized crime money laundering operations in Liechtenstein. A key corruption vehicle for Putin is the Ozero Dacha Cooperative, a housing cooperative founded by Putin and his neighbors in 1996 that is located in a northern coastal suburb of St. Petersburg. Russia’s corrupt power elite under Putin has been dubbed the Ozero Cooperative Physicists Group. Ozero is Russian for lake. One of the co-founders of the cooperative, Vladimir Yakunin, was sanctioned by Treasury and was identified as head of the state-owned Russian Railways company and was described as "a close confidant of Putin." Yakunin is a key Putin financial contact and has set up a huge business empire outside Russia and is also a director at Gunvor. The Putin-Gazprom connection was identified as connected to Sergei Fursenko, who is on the Treasury sanctions list. 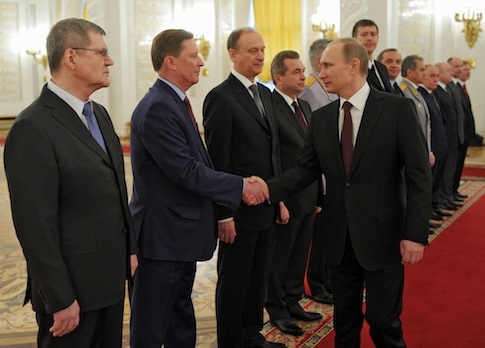 Fursenko is head of Gazprom Gas-Motor Fuel, a subsidiary of Gazprom, and was on Putin’s council for sports development. Andrei Fursenko, Sergei’s brother, also is a Putin associate, having helped start the Ozero cooperative and also working as head of two Russian ministries since 2002. Putin’s personal banker and the official who knows the most about Putin’s illicit wealth and corruption was identified as Yuri Kovalchuk, who is the largest shareholder in Bank Rossiya, the sole institution hit by the Treasury sanctions. Kovalchuk controls the bank and was described by Treasury as one of Putin’s "cashiers." Putin is believed to have benefitted from another deal involving Vladimir Smirnov, who heads a nuclear export company called Techsnabexport that was linked by U.S. officials to the illicit export of polonium—the poison used by Russian intelligence to kill KGB defector Alexander Litvinenko in 2006. Smirnov, a SPAG director, was the beneficiary of a Putin decree in 1996 that gave his company, Petersburg Fuel Co., a monopoly over retail gasoline sales in the St. Petersburg, allowing him to amass a fortune. Smirnov’s partner in the gasoline business was Vladimir Kumarin, head of the Tambov Gang organized crime group. Two other key Putin cronies are Nikolai Patrushev, former head of the Federal Security Service, known as the FSB, and currently head of Russia’s Security Council, the key policymaking body in the Kremlin; and Victor Cherkesov, a former KGB official who once headed Russia’s counter-drug agency. Cherkesov currently heads the Russian Federal Agency for the Procurement of Military and Special Equipment. Both Patrushev and Cherkesov are linked to Putin through the Ozero cooperative. Another key figure in the Putin corruption network is Nikolai Shamalov, a major shareholder in Bank Rossiya who formerly owned what is called "Putin’s Palace," a large residence on the Black Sea near Krasnodar. Shamalov’s son Yuri is president of Russia’s largest pension fund Gazfond, which was sold by Gazprom in 2006 to the SOGAZ Insurance Co. That fund was controlled by Bank Rossiya. Russia’s Foreign Ministry this week threatened unspecified retaliation against JP Morgan Chase after the bank, in seeking to comply with U.S. financial sanctions, temporarily blocked a funds transfer from the Russian embassy in Astana, Kazakhstan to SOGAZ. A Russian Foreign Ministry spokesman called the action "absolutely unacceptable, illegal and absurd" in a statement issued this week. "Washington must understand: Any hostile actions against the Russian diplomatic mission not only constitute a flagrant violation of international law but are also fraught with retaliatory measures that will inevitably affect the work of the U.S. Embassy and the U.S. consulate general offices in Russia," the statement said. JP Morgan Russia said through a spokeswoman that after consulting regulators "we are processing this transaction."